TP-2955 Fluorinated grease | Tom-Pac Inc.
Bearings exposed to harsh operating conditions involving constant high temperatures require a grease with superior lubrication protection that extends beyond what typical mineral oil based, and even synthetic hydrocarbon and ester based greases can provide. 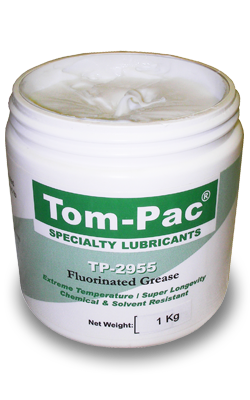 Enter Tom-Pac TP-2955 Fluorinated Grease. TP-2955 uses a base oil comprised of 100% perfluorinated polyether (PFPE) and a thickener of polytetrafluoroethylene (PTFE). Because these chemicals are both based on fluoro chemistry, they have properties that can not be matched by standard or even conventional synthetic greases. High temperature protection for extended time periods. Unmatched chemical resistance: TP-2955 grease is not affected by most chemicals, solvents or acids, making it the choice lubricant in bearings exposed to aggressive substances. Corrugating, metal & plastic fabrication and molding, metal casting, glass manufacturers, chemical and petrochemical, textile, automotive. Specific examples: Bearings on conveyor systems exposed to high heat ovens as in painting lines, & food ovens. Excellent longevity and low thermal evaporation makes it extremely cost effective. Perfect for high temperature applications or sealed for life bearings.